No Competition! commences with a series of new cultural walking-trails developed by designer Paul Farrington as part of a Royal Borough of Kingston initiative – funded by the Mayor of London’s Outer London Fund and Design for London – to create new ways for pedestrians to discover and enjoy Kingston town centre. Research for the project has been informed by the history of Surrey Walking Club, Victorian photographer Eadweard Muybridge, the sporting pursuits of Orienteering and Pedestrianism – popular in the late 1800s – and interviews with local residents. For No Competition! 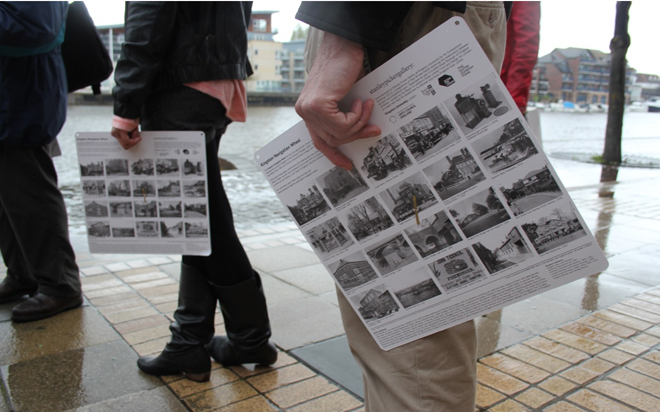 Farrington has designed the Kingston Navigation Wheel, a special paper disc that visitors can use to explore alternative routes around the town, discover individual and collective histories, and newly observe the details that make up their everyday surroundings.